Troxel Helmets Home Testimonials Head injuries can happen anywhere, anytime. Head injuries can happen anywhere, anytime. I've had four concussions and because of that, it takes the simplest fall to create another one. I do not get on a horse and often where a helmet when around the youngsters now. Last unplanned discount happened on a green filly that scared herself, we were in the arena with a soft landing. I got only a mild concussion, but the helmet was damaged on inside, so I know it would have meant a hospital stay rather than trip. Cracked ribs, huge bruise, mild concussion was it. First concussion was trying to catch a young stud colt while on medication. Got halter caught in foot and flipped over backwards...ended up severe concussion and in hospital for a couple of days. Next one was taking a photo of a new foal a couple days old at dusk. Caused the flash to go off and the mare attacked the camera I was holding, knocking me off my feet, hitting our hard ground and again, another concussion. So you don't have to be "on" a horse to get a concussion....a helmet would have saved me both times. 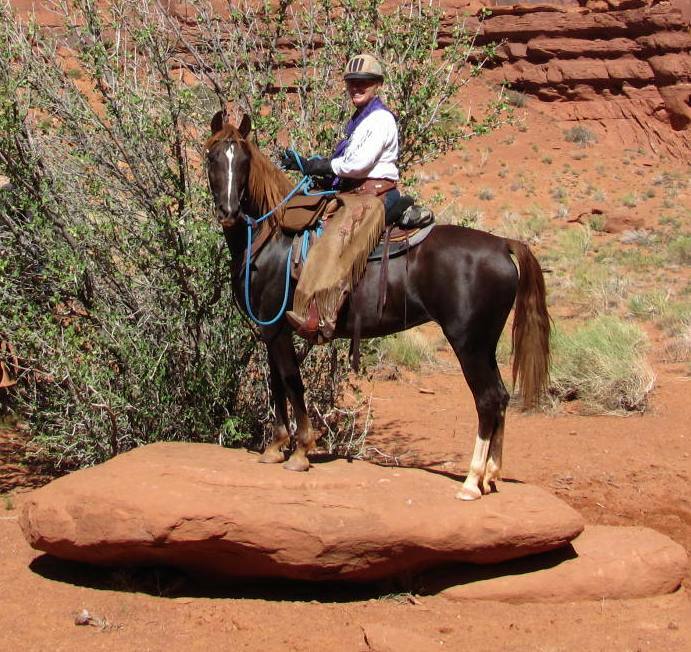 Lastly, I'm excited that my photo of myself and my Morgan mare Ayla on a rock in Monument Valley a couple years ago is now being used in a national ad campaign for the riding program Pathways. It is finally getting accepted to be wearing a helmet while riding in "full" western gear/attire. I swear by wearing a helmet and now have my husband wearing one.